Below is a viewpoint from Chapter 3 of the Foresight Africa 2019 report, which explores six overarching themes on the triumphs of the past years as well as strategies to tackle the remaining obstacles for Africa. Read the full chapter on harnessing Africa's youth dividend. Most commentators on employment in Africa believe it faces an unprecedented youth employment challenge. Facts to back this up include that Africa is demographically the world’s youngest continent, and that by 2050, the estimated number of young people entering the labor force there will exceed that of the rest of the world combined. Historical data tell a different story. It is true that Africa’s demographic and economic transformations are well behind the rest of the world—in part because most African countries started these processes later, with less developed economic, social, and political institutions. But Africans’ youth as a share of their working age population, at its maximum, was about half the size of the peak youth populations of East Asia, and 20 percent less than the South Asia peak (Figure 3.5). Actually, Africa’s youth bulge in the labor force peaked at the turn of this century, at 38 percent (only 4 percentage points higher than the Asian peaks), and is now on the decline. All other regions made it through this period of peak youth share of the labor force without facing a crisis. Africa should be able to as well. Opportunities for higher per capita growth should be on the horizon. Why are they not? 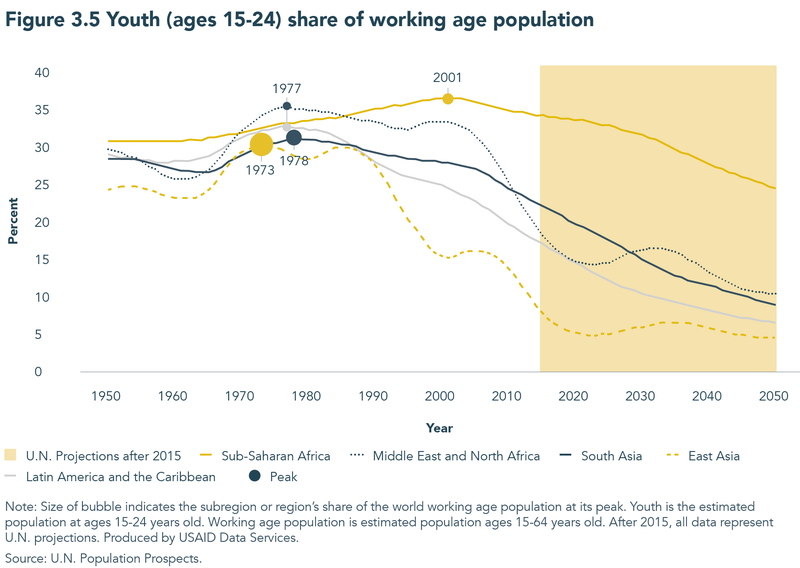 What is unique about Africa is how slowly the youth share of the working age population is expected to decline. While some are promising that this high youth share in the labor force will generate a demographic dividend for Africa that will help boost economic growth, again the historical data tell a different story. Crucially, the size of the dividend depends on the rate of demographic transition, and Africa’s transition is proceeding very slowly. The world’s 10 highest fertility countries are now in Africa, and these countries, which have not even started the transition, will keep the regional fertility averages and youth shares up at least until mid-century. This will be a drag on economic growth. In Kenya and Ghana, for example, fertility has been declining steadily as life expectancy increases (the essence of the demographic transition), and now the total expected births per woman has just moved below four. Even in these countries, though, the transition will not make the fast progress we saw in other regions owing in part to the stubbornly high share of young women having children before the age of 18 (8 percent in Kenya and 7 percent in Ghana, compared with only 4 percent in South Asia and 2 percent in East Asia). The regional average is an abominable 10 percent. When women marry and have children early, they tend to be less educated and have more children. Unmet demand for contraception among women who are married or in a union is also stubbornly high—30 percent in Ghana and 17 percent in Kenya, compared to just 4 percent in East Asia. To reduce fertility rates and realize any demographic dividend, Africa will have to aggressively expand contraceptive access, and support young women’s health and development through adulthood. Youth is widely recognized as an important skills-building period, with education being a crucial part. Africa’s education systems could do a lot better at building the foundational skills for the future labor force. However, educational and skill-building institutions do not create jobs. Firms and people do. Wage employment is created when new firms are created and existing firms expand production, finding new markets. This takes time, probably decades before most employment will be in modern firms in the case of African countries. Indeed, it could be argued that owing to better education policy than economic policy, young Africans are over-skilled for their economies, which is one reason why unemployment is highest among the most educated youth. Lacking opportunities to use their skills, they are frustrated and vocal. The majority of African youth, of all skills levels, will have to seize opportunities and create their own living through self-employment, often with family members, on farms or in nonfarm sectors. A few people, typically 2-5 percent of the labor force, will be able to create a growth-oriented business and employ five or more people. This challenges the massive push toward youth entrepreneurship as the solution to the region’s unemployment challenge. Sadly, youth businesses—operating in an unfriendly economic environment, with limited capital, networks, and knowhow—tend to remain small, livelihood-sustaining ones, serving local markets. More training does not solve this problem, unfortunately. The focus on Africa’s youth as an instrument of development, and the subsequent explosion of youth training and development programs, is misplaced. Education is needed for more than earning money—it enables all aspects of youth transition from dependence to independence. But education is not enough, as youth need jobs and an opportunity at decent work; so do their parents, and so will their children. All the attention on the perceived deficiencies of youth, and the interventions targeting them, do not create jobs or increase opportunities in self-employment. Put simply, there is no silver bullet. Imagine instead if all the money being spent now on tiny youth projects with tiny results were spent instead on improved infrastructure, connectivity of information flows, trade facilitation, and better management in the public and private sector to facilitate formal sector job creation? Hard to do, but it is what youth really need.